There are, of course, differences in district fundamentals and the campaign skills of individual candidates, to say nothing of challenger quality, which can vary dramatically. California Rep. David Valadao and New York Rep. John Katko each represent a district that went comfortably for Clinton two years ago, but most handicappers now expect both Republicans to survive in the fall. But taken as a group, and considering House midterms over the past few decades, it’s reasonable to estimate 70-75 percent of those Clinton/House Republican seats will flip, including all the open seats in that category. That would give Democrats 18 seats. 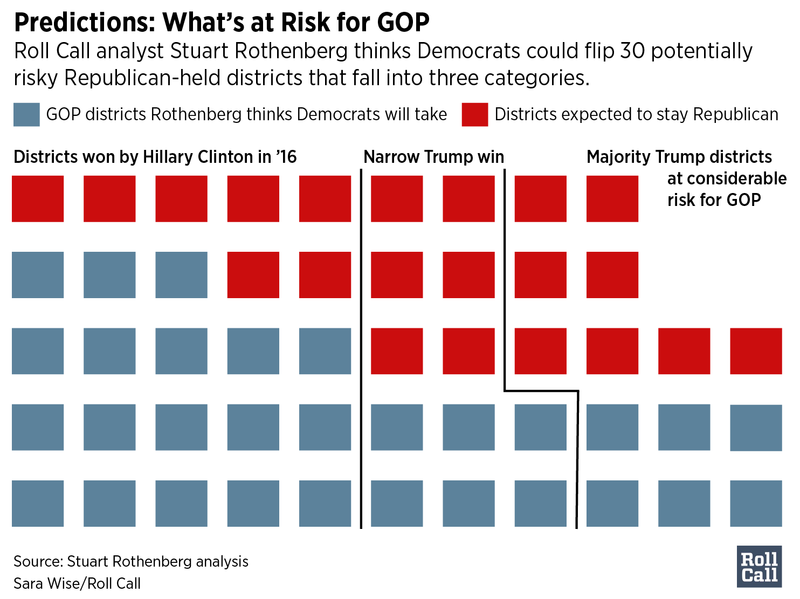 The next basket of Democratic targets includes a dozen seats in districts that Trump carried — but with less than 50 percent of the vote. Again, some of these seats don’t look very vulnerable — Florida Rep. Mario Diaz-Balart’s, for example — but other incumbents, including Rep. Jason Lewis in Minnesota and Iowa Reps. Rod Blum and David Young, are in terrible shape. Democrats won’t sweep these opportunities, but they could well win six of the 12 seats in this category. A third category of races includes seats carried by Trump with more than 50 percent of the vote but which look at considerable risk. Again, some of these targets are more uphill for the Democratic nominees (Rep. Cathy McMorris Rodgers of Washington, the House Republican Conference chairwoman, for example), while other incumbents (Reps. Andy Barr of Kentucky, Dave Brat of Virginia and John J. Faso of New York, for example) clearly are vulnerable. Democrats ought to be able to win more than a third but less than half of the 14 seats in this category, so let’s give them six seats. I have no idea where those seats may be, which is one of the benefits of adding up baskets of races rather than trying to pick winners race by race. That adds up to GOP losses of 32 seats. But the arithmetic doesn’t end there. Republicans are likely to offset some of those losses by picking up an open seat in western Pennsylvania (the result of the state’s new map). Moreover, they have two prime targets of their own in Minnesota (where Democratic Reps. Tim Walz and Rick Nolan are not seeking re-election). Let’s assume they pick up one of those Minnesota seats. Adding up all the numbers, my back-of-the-envelope assessment gives Democrats a ballpark net gain of 30 seats, seven more than they need for control of the next House. Obviously, this could change over the next two months, since some candidates will stumble while others will surprise to the upside. Public opinion could well change, even in a time of polarization. If some longer-shot races become more competitive, larger Democratic gains are possible. A net change of 30 seats wouldn’t be out of sync with historical trends, though it would be at the low end of electoral waves. Since 1950, there have been 17 midterm elections, of which eight were “wave elections” during which an unpopular president’s party lost at least 25 seats. Three of the “waves” — 1950, 1982 and 2006 — were relatively modest, with the president’s party losing “only” between 26 and 30 seats. In the other five — 1958, 1966, 1974, 1994 and 2010 — the waves were tsunamis, ranging from 48 seats to 63 seats. Recent responses to the “generic ballot” poll questions suggest that at least a modest Democratic wave is likely in the House. The August NBC News/Wall Street Journal poll found Democrats with an 8-point advantage on that question, while CNN and Fox News put it at 11 points, Quinnipiac had Democrats with a 9-point lead, and The Economist/YouGov had the margin at 6 points. The latest Washington Post/ABC News poll had it at 14 points. The way districts were drawn after the last census and the polarization of our politics combine to make a small partisan wave more likely than a larger one. But waves can be unpredictable, building dramatically in the final two months. If Republicans do hold on to their House majority in November, it will be because of the districts they drew and their success in turning out their voters. The 2016 election told us that not all of the old political rules still apply. That should make observers — and handicappers — cautious about the upcoming midterms. But even assuming that Trump voters remain loyal to the president’s party, district-level and national data suggest that considerable Democratic gains are likely and the party has about a 75 percent chance of winning the House in November. I’ll come back to these baskets again before November, but for now they show Democrats likely to gain about 30 seats — which would give them a narrow but clear majority in the next House.